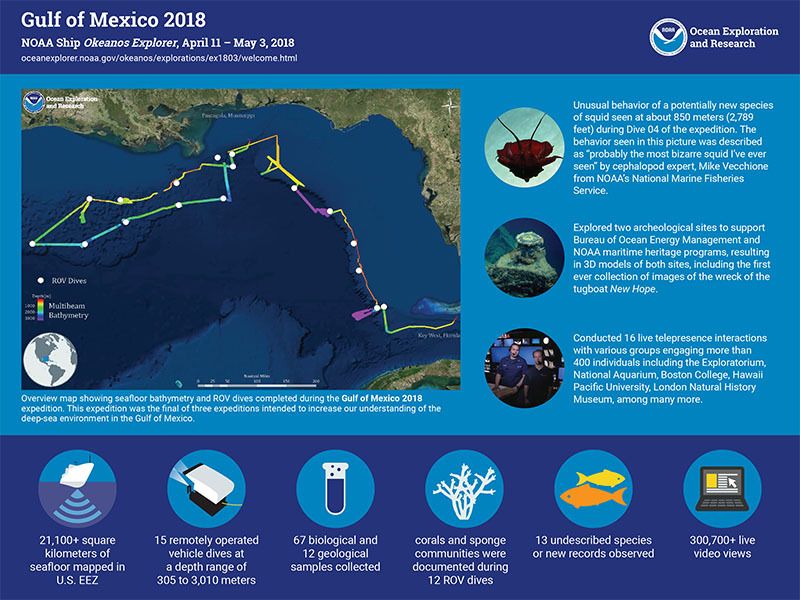 Infographic summarizing accomplishments from the Gulf of Mexico 2018 expedition. Image courtesy of the NOAA Office of Ocean Exploration and Research, Gulf of Mexico 2018. Download infographic (pdf, 1.6 MB). This expedition was the final of three expeditions intended to increase our understanding of the deep-sea environment in the Gulf of Mexico. Video reviewing the goals, objectives, and highlights of the Gulf of Mexico 2018 expedition. Video courtesy of the NOAA Office of Ocean Exploration and Research, Gulf of Mexico 2018. Download larger version (mp4, 163.9 MB). 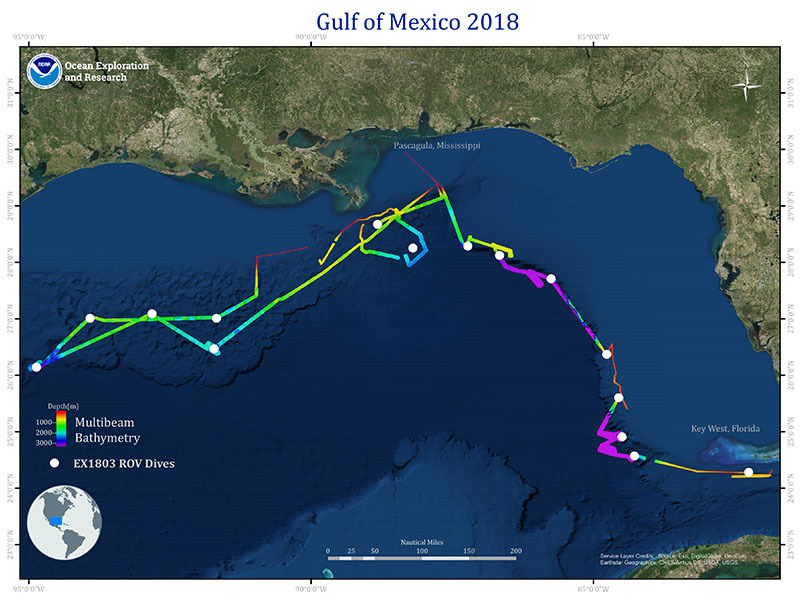 Gulf of Mexico 2018 was a 23-day telepresence-enabled expedition to collect critical information and acquire data on priority exploration areas identified by the ocean management and scientific communities. The goal of the expedition was to use remotely operated vehicle (ROV) dives in combination with seafloor mapping operations to increase our understanding of deep-sea ecosystems and collect scientific information to support future management decisions. Major accomplishments from this expedition are summarized below. Download a PDF (2.5 MB) of this summary. Overview map showing seafloor bathymetry and ROV dives completed during the Gulf of Mexico 2018 expedition. Image courtesy of the NOAA Office of Ocean Exploration and Research, Gulf of Mexico 2018. Download map (pdf, 18 MB). Unusual behavior of a potentially new species of squid seen at about 850 meters (2,789 feet) during Dive 04 of the expedition. Coral and sponge communities documented during 12 of the ROV dives (Dives 03 - 15), including five high-density communities of deep-sea corals, one of which is currently among the deepest high-density communities (2,600 meters) known from the Gulf of Mexico. First-time documentation of several species of sea stars feeding, including one feeding on a black coral. First-ever scientific surveys with submersibles in unexplored areas of Perdido Canyon. Possible first-ever in situ observation of the rare sea star, Remaster palmatus (family Korethrasteridae). Collected 67 biological samples (22 primary and 45 associated and commensal taxa). Thirteen of the biological samples represent substantial range extensions, and several of these may be new species to science. Surveyed two sites near priority areas identified by the Gulf of Mexico Fishery Management Council for potential future establishment of Habitat Areas of Particular Concern (HAPC). Information collected during those dives will provide critical baseline information to inform science and management decisions. Explored two proposed expansion areas for Flower Garden Banks National Marine Sanctuary to collect critical baseline information to inform science and management needs. Explored two archeological sites to support Bureau of Ocean Energy Management (BOEM) and NOAA maritime heritage programs, resulting in 3D models of both sites. During Dive 01, archaeologists and scientists explored the shipwreck of the tug boat New Hope for the first time. Information collected during the dive confirmed the identity of the wreck and might help support an application of the New Hope shipwreck to the National Register of Historic Places. During Dive 02, archaeologists and scientists performed a reconnaissance survey of an unidentified wooden vessel with a limited number of metal items inside that may be related to propulsion or steering (e.g., prop shaft or rudder post). Described by our resident cephalopod expert as “probably the most bizarre squid I’ve ever seen,” we encountered this unusual squid while exploring an unnamed mound at a depth of ~850 meters (2,790 feet) during Dive 04. Its arms were folded back in what may be a defensive posture, but to such an extreme degree, it had lost its squid-like appearance. Video courtesy of the NOAA Office of Ocean Exploration and Research, Gulf of Mexico 2018. Download larger version (mp4, 33.7 MB). Mapped more than 21,100 square kilometers of seafloor in the Gulf of Mexico U.S. Exclusive Economic Zone (EEZ). These included several areas that had never been mapped with high-resolution multibeam sonars, such as portions of Perdido Canyon, Pourtales Terrace, and the West Florida Escarpment. Multibeam mapping operations also revealed two new gas seep fields at Whiting Dome and Walker Ridge 488. An overview of cold seeps, including what they are, how they form, how we find them, and their importance as habitat for a unique form of life in the deep sea. Video courtesy of the NOAA Office of Ocean Exploration and Research, Gulf of Mexico 2018. Download larger version (mp4, 119.9 MB). Collected 12 rock samples that can be used for geochemical composition analysis and age-dating to increase the understanding of the formation of these features. Documented two new chemosynthetic communities during two ROV dives (Dives 06 and 07) including a brine pool and extinct brine waterfall at Hidalgo Basin and gas seeps at Walker Ridge 488. Explored previously unmapped and unexplored sinkholes on the Pourtales Terrace. , including multibeam, single beam, subbottom, ADCP, XBT, CTD and dissolved oxygen profiles, surface oceanographic and meteorological sensors, video, imagery, and associated dive and video products. All of the data from this expedition will be made publically available through national archives. Looming out of the gloom in the deep water of the Gulf of Mexico, the tug New Hope appears as a long forgotten crumbling relic. With the bow riding proud and a towering smoke stack, the tug sits on the seafloor as if still making way to the next port. Humble, yet powerful, tugs provide aid to vessels in distress, tow barges to move commodities to markets, and assist ships entering and leaving ports. New Hope is a well-preserved example of this vessel class. Video courtesy of the NOAA Office of Ocean Exploration and Research, Gulf of Mexico 2018. Download larger version (mp4, 58.7 MB). , opening a window to the deep-sea. Shared the live video feeds of the expedition with the public worldwide via the Internet, with the live video receiving more than 300,700 views via the NOAA Office of Ocean Exploration and Research (OER) YouTube channel. Expedition content on the OER website received over 99,700 views. Conducted a successful Facebook Live question and answer session that answered over 20 questions and received over 4,000 views. 85 scientists, managers, and students from 35 institutions in the United States, Japan, Russia, Norway, United Kingdom, and Canada participated as members of the science team through telepresence. Received news and media coverage by various media sources including National Geographic, Ocean Conservancy, Business Insider, New Zealand Herald, Daily Mail, ScienceAlert, Live Science, Inquisitr, Washington Post, Oceans Deeply, as well as others. Conducted two tours of NOAA Ship Okeanos Explorer for Congressional Staffers and 20 students from St. Stanislaus College in Mississippi. Conducted 16 live telepresence interactions with various groups engaging more than 400 individuals including the Exploratorium, National Aquarium, Boston College, Hawaii Pacific University, London Natural History Museum, among many more.